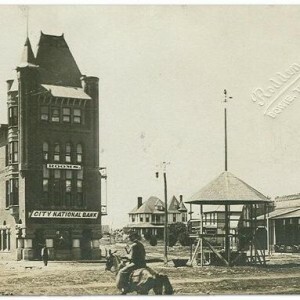 Settled in the early 1860s, the town, like many in Texas, didn’t really get started until the arrival of the railroad. In Bowie’s case the year was 1882 and the railroad was the Fort Worth and Denver. In August of that year a townsite was laid out and a post office applied for. Bowie almost instantly became the most important market and banking center between Fort Worth and Wichita Falls. The population reached 1,000 by 1885 and eight years later The town got its second railroad, the Chicago, Rock Island and Texas. 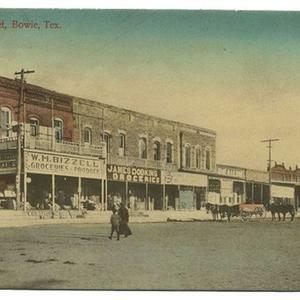 Bowie TX 1900The population for the 1900 census was estimated at 2,600. Bowie had around 3,000 people during the 1920s and by the 1950s, it was approaching 7,000. It reached its zenith in the late 1980s with 5,818 residents, making it the largest town in Montague County. It dipped to 4,990 for the 1990 census and rose to the present 5,219 (2000). WHY IS BOWIE NAMED BOWIE? Is Bowie named for the Texas hero Jim Bowie? Probably, but a popular workman on the railroad was named ‘Buie’, so his name was tossed about as a choice. His name suggested the Alamo hero, and it also symbolized those early pioneers whose strong spirit helped carve out the West. That strong pioneer spirit still prevails in Bowie today!